John Leventhal and Roseanne Cash in sync at Flatbread Company. 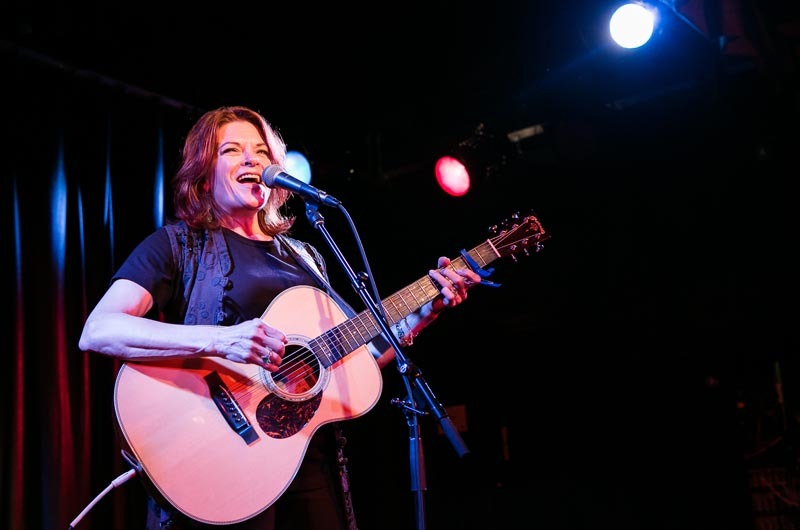 A large crowd formed at the entrance to the Flatbread Company last night as music fans and activists alike surged through the door for the Rosanne Cash concert, benefiting the Gay Head Lighthouse. 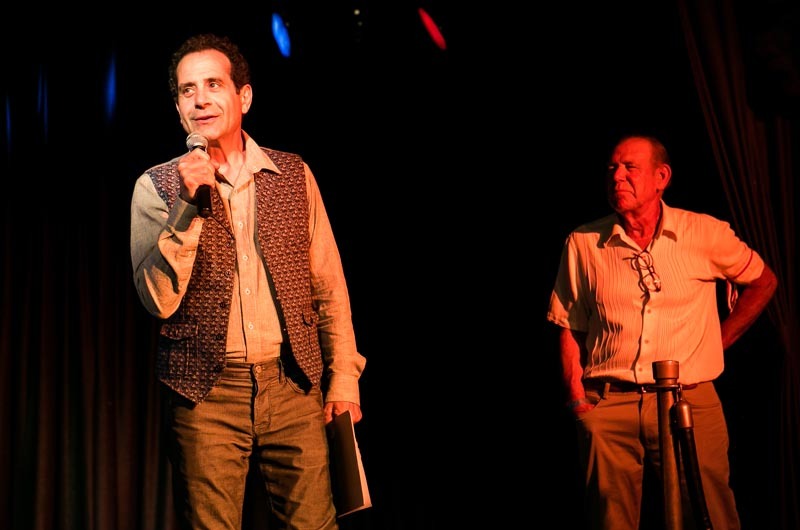 The evening started with a live auction, led by the actor Tony Shalhoub. Five items were for sale, including a week in a Paris flat, which sold for $6,000 and a helicopter tour of Martha’s Vineyard with a dinner in the Lighthouse, which sold for $4,500. In total, the auction raised an impressive $27,000. 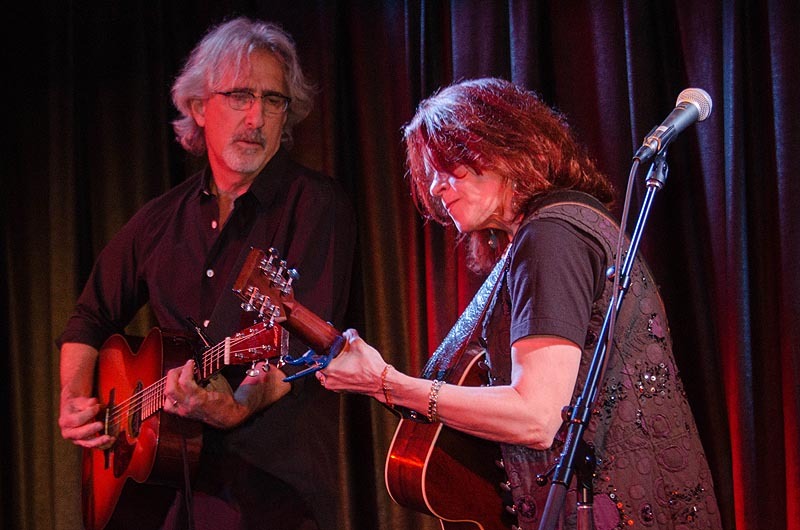 The event really got going after the auction, though, when Rosanne Cash took the stage, along with her guitarist and husband, John Leventhal. Although the concert tickets read Rosanne Cash In Concert With John Leventhal, it would sell both of them short to say that Mr. Leventhal was just a supporting act. The two musicians were at one, creating a true musical unit. Throughout the seventeen-song set, Ms. Cash and Mr. Leventhal communicated effortlessly through fleeting glances and silent gestures. Every time Ms. Cash took a breath, Mr. Leventhal filled the gap with blues infused country riffs that drove the music along. On songs like Motherless Children, Ms. Cash picked up her own guitar and laid down chords, allowing Mr. Leventhal to show off a little bit on guitar solos. That song ended with a frantic, neck sweeping outro that had the entire crowd cheering and clapping their hands. While there were moments of passion and energy throughout the show, there were also times when the crowd seemed absolutely paralyzed by the duo on stage. The audience fell into a trance as Ms. Cash sang Ode To Billie Joe, Bobby Gentry’s infamous song about Billie Joe McCallister’s jump off the Tallahatchie Bridge. Although the venue was full to capacity, a hush fell over the room as the crowd leaned forward to hear every nuance of Ms. Cash’s sultry vocals and Mr. Leventhal’s sustained, reverb-heavy, guitar notes. On Tennessee Flat Top Box, Ms. Cash put down her guitar and the audience happily filled the void, clapping along to the beat as Mr. Leventhal plucked out a repeating staccato guitar riff. About a minute into the song, Ms. Cash whispered into Mr. Leventhal’s ear and he laughed out loud but never missed a note. At the next break in the lyrics he stepped up to the microphone and said, “It was just pointed out to me that I am playing far too fast, I guess I got carried away!” The audience happily forgave him the tempo change, just as caught up in the music as he was. After playing Seven Year Ache, Ms. Cash and Mr. Leventhal said goodbye and stepped off the stage, but the lights stayed dim as the audience shouted for more. Unsurprisingly, two minutes later the pair stepped back on stage for an encore, asking the audience for song suggestions. Somebody shouted out Sea of Heartbreak and Ms. Cash complied. She wrapped up the concert singing Good Intent, a song about her grandfather, William Cash, a Nantucket Whaler who she said once shipwrecked off the coast of Long Island. He was just one of four survivors. But, she added, he never had trouble sailing near Martha’s Vineyard, thanks to the Gay Head Light. Click here to see more photographs from the concert.